I think they’re a great way to challenge your dog and break the monotony of boring daily routines. Most interactive dog toys were created for the purpose of “play”. I recently tried one that was created for the purpose of making everyday feeding time more enjoyable for your dog. It’s called the Rock & Bowl Puzzle Feeder. The folks at PAW5 gave me one to try. What’s The PAW5 Rock & Bowl Like? 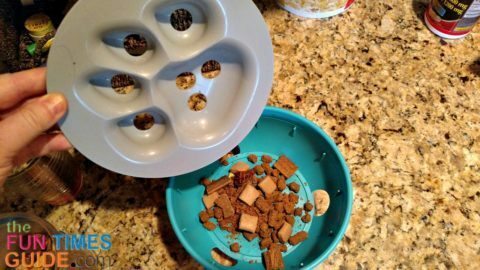 In my opinion, it’s similar to a Buster Cube (which my dog also loves), but it’s much easier for your dog to get the treats out of this bowl. Technically, the Rock ‘n Bowl is a slow feed dog bowl that gets your dog to slow down when he’s eating — so he’s not wolfing down his food too quickly. It’s a self-balancing bowl. So no matter how far it is tipped to the side, it always “rights” itself back to upright. There are 3 large holes on the bottom of the bowl (where the dog food & treats reside). There’s also 1 large paw print shape in the lid that has 4 medium size holes and 3 small holes in it. I’m not sure what the holes in the lid are for. You can put some treats that are larger than the holes themselves on the lid there, but the dog will just eat them normally — without any challenge at all. The challenge comes when your dog tries to get the treats from the bowl that are under the lid. 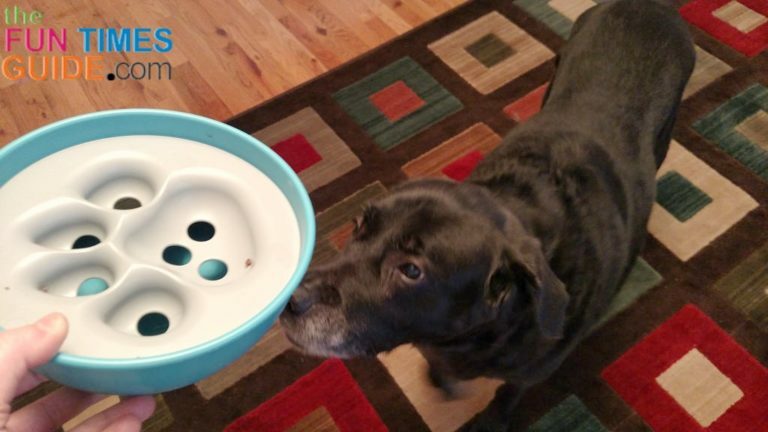 Your dog will eventually figure out that he needs to nudge the bowl with his nose in order to get the treats inside to fall out of the 3 large holes on the bottom sides of the bowl itself. Since my dog doesn’t get this bowl every day, he see this as a “game” or “challenge” that brings fun new rewards (lots of different treats instead of just one at a time, like he usually gets daily for doing good things). I would encourage you to always put some hard treats inside the bowl — that way it will make a unique sound when your dog nudges it. So he’ll know there are still some treats inside that he needs to get out. For the soft treats, I recommend soft liver treats — like Biljac, because they’re super smelly and will keep your dog interested. My dog loves Biljac! I wouldn’t use wet dog food from a can — especially if it has any type of sauce to it (unless your dog is using this bowl outside), because that would create quite a mess. 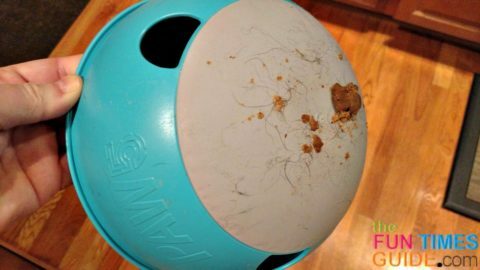 Besides, shapeless wet dog food wouldn’t easily fall out of the holes in this bowl — so it would create more of a frustration than a challenge for your dog. You may want to put a few larger treats on top — on the lid of the bowl — at the beginning of each play session. They won’t fall through the lid, so your dog receives a treat right away just for acknowledging the bowl. He will quickly figure out that there are more tasty treats inside. Keep in mind that whatever you put inside will, indeed, fall out of the 3 large holes on the bottom of the bowl as your dog moves the bowl around. So be sure to put the bowl on a surface where you don’t mind crumbs creating a mess, and a place where you don’t mind your dog licking (and drooling on!) that area of the carpet or floor. It’s a great way to introduce a treat-based challenge to your dog. A fun toy for dogs! It’s a good way to get your dog to slow down when eating. The entire dog bowl is water safe and dishwasher safe too. The plastic is FDA-compliant, BPA-free, and phthalate-free. It’s a relatively quiet dog toy. 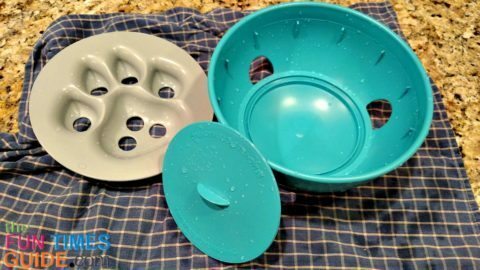 The 3 holes on the bottom of the bowl are very large, so anything you put inside the bowl falls out rather easily — almost too easily. For example, they say the bowl holds 4 cups of food, but the second you put anything inside it begins to fall out. So it’s rather cumbersome to keep it all in the bowl until you place it on the floor for your dog. There were no instructions that came with it — so no helpful tips for how to best utilize those holes in the top of the lid, for example. I would say this dog food bowl is best for timid or shy dogs, and dogs that don’t normally “play” with toys on their own — because the treats fall out so easily, so the dog is constantly reminded to push the bowl to spill more of the treats out. I definitely give it a paws up for less energetic dogs. Large dogs that are more active (or destructive) would probably get bored with this bowl rather quickly since the treats fall out of the 3 large holes on the bottom so fast. My dog — being the shy and timid type — will continue to receive this dog food bowl as a fun “treat” once a week or so. It’s actually quite perfect for my dog, because he doesn’t really play with toys or seek out other things to do on his own. He’s a 10-year-old Lab/Pyrenees mix, and he mostly just lies around all day (when he’s not following me like a shadow). It takes something that distributes treats without much effort to keep my dog’s attention for a long time. On average, my dog spends about 15-20 minutes trying to get all of the different treats out of this bowl — especially when I include a wide variety of sizes, shapes, and textures. My dog still enjoys this slow feed dog bowl… a lot! I fill it up and let him “play” with it a couple times each week. But I discovered one other thing — another helpful tip — in case you decide to try this dog food bowl too. TIP: I now put the PAW5 dog bowl itself on top of my dog’s bed each time — instead of placing it on the carpet. That way our carpet doesn’t get messy (drool-covered with food crumbs in it). Only the dog bed does! Surprisingly, the bowl’s rubber bottom keeps it from rolling off the dog bed. And the best part: the dog bed cover is a much easier to clean than the carpet is! I just unzip it, stick it in the washer, then toss it in the dryer. By the way, the reason for all the ‘mess’ that gets on the carpet is the fact that the 3 large holes on the bottom of the bowl are mostly where the dog keeps attempting to get the food out from. There is constant licking along the bottom of the bowl — which means the surface below the bowl inevitably becomes soaking wet from dog drool. And once it’s wet, it collects anything in its path, including dog treat crumbs… and dog fur. So now it’s a joy for me to watch my dog get the treats out, since the mess stays on his dog bed. I’m so glad my dog finally found a “treat toy” that keeps his attention for longer than 10 minutes! I recently discovered that my dog likes it even better if I smear some peanut butter onto the lid of this dog bowl. Then, on top of that, I sprinkle a few pieces of dog treats (or as pictured here, dog kibble) on top of the peanut butter. the bottom of the bowl. Here it is 6 months later, and my dog still loves the PAW5 dog bowl! If I’m home and can watch him, I give him this PAW5 “treat toy” to play with — loaded with a variety of dog food & treats of course. If I’m heading out and want to give him a “treat toy” to occupy himself while I’m gone, then I give him a stuffed Kong. My newest tip: When you’re cleaning the PAW5 bowl, it can be tricky to get out the self-balancing base that “locks” inside the center of the bowl during use. The short “tab” that you’re supposed to pull on to lift the base up & out doesn’t really help much. I discovered if you hold the PAW5 bowl in your 2 hands and gently squeeze the sides of the bowl inward, the base will automatically pop out! That’s so much easier than trying to grip & grab & lift that tiny tab.